Solution: Melatonin is an animal hormone believed to have a role in regulating the sleep cycle: The structure of melatonin incorporates two nitrogen atoms. What are the hybridization state and geometry of each nitrogen atom? Explain your answer. 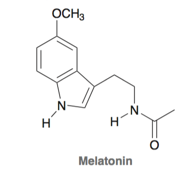 The structure of melatonin incorporates two nitrogen atoms. What are the hybridization state and geometry of each nitrogen atom? Explain your answer.